Horned Chinese Dragon art ideas! This is the fourth week of the “How i Safari” Safari Ltd. promotion and this week They sent me a Horned Chinese Dragon (non-affiliate link). The Horned Chinese Dragon is typically seen for New Year festivities. 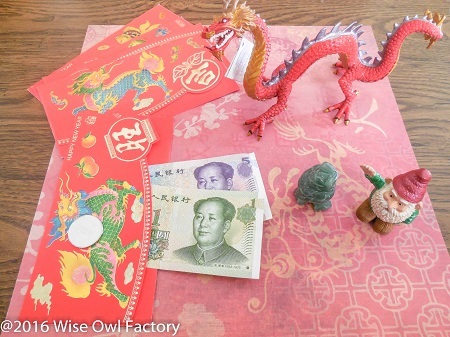 Both Dragons and the color red are considered to bring good luck. The dragon is thought to bring rain, also. 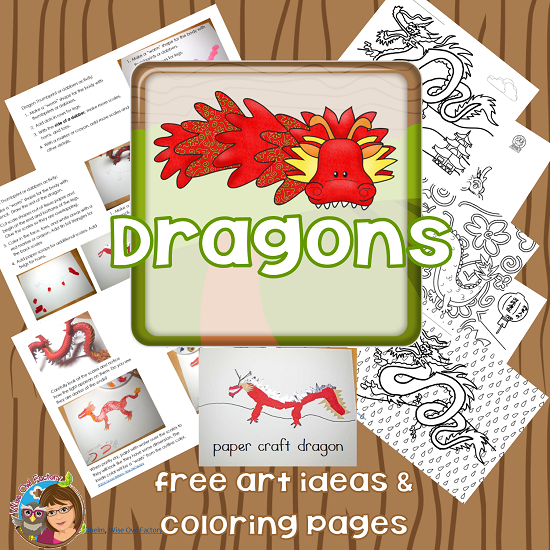 This post includes some coloring pages and art ideas for making dragons. 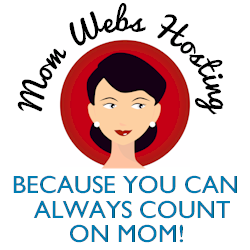 If your children or students like to paint or work with paper crafts there may be an idea here to use. There was no other compensation involved, and this review is my own opinion. 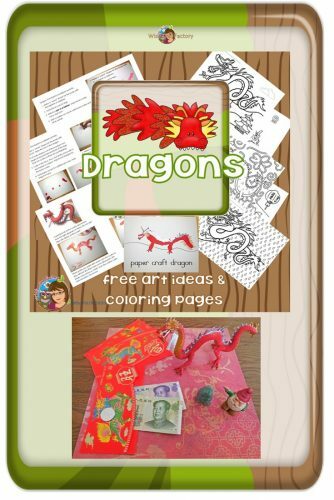 The free printable includes art activity suggestions and dragon coloring pages. As you know, Gnorman the Green Gnome recently flew to Shanghai where he learned many new things from A to Z, as shared at that blog post. He also recently learned all about the Chinese Zodiac, as described in the post. Here he is pictured with his new friend the Jade Owl and other souvenirs, along with the Safari Ltd. dragon. All of this travel made him feel creative, and here are some of his art projects about dragons. 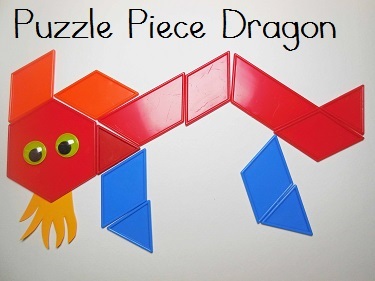 Because the Chinese dragon is long and skinny, it is easier for children to draw. Then add triangles and that makes a pretty nice art piece. Children could either use thumbprints or dabbers to make a long worm shape, to begin with, and then add some markers or crayons to make the first idea. 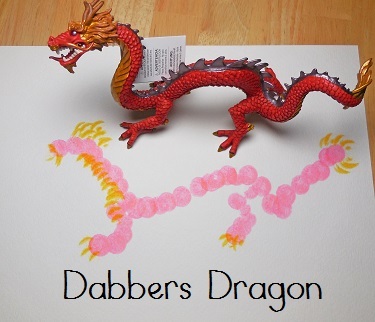 A dabber used sideways (on the edge) will make the horns, yellow scales, and toes. 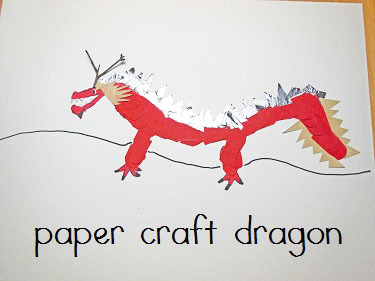 Another idea is to use paper scraps, tissue paper, tin foil, and small twigs for a DIY paper craft dragon. The instructions are included in the PDF. 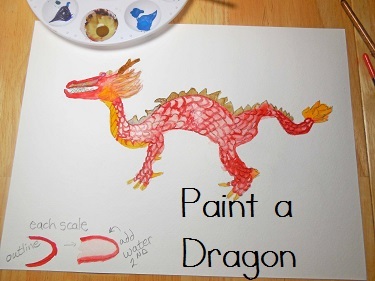 Painting is very fun, also, and the dragon can be as intricate as the child wants it to be. If the scales are outlined in paint and allowed to dry somewhat, a water wash can be added to make it look like there is some dimension in the painting.